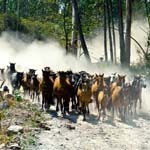 The celebration of this Fiesta in Sabucedo (Galicia) has been taking place since the Bronze Age, in the same fashion and using traditional rancher tools. The name of this festivity, originally in Galician language, is A Rapa das Bestas, which means “The Shaving of the Beasts”. It is believed that the people from Galicia tried to domesticate wild horses since the Bronze Age. It is an ancient ceremony, even described by the Roman historian Strabo with these words: “with horns and shouts they hound the beasts through the mountains until they manage to corner them. Some of them are sacrificed for nourishment; others are tamed and serve as a mount for the battle”. Because there are so many wild horses’ herds in the Galician Mountains, the peasants and farmers of the area used to try to gather as many horses together as they could, in order to crop their manes and seal them for identification. Already in the XVIII century, there’s written record of this event turning into a social festivity. Today, it is one of the most spectacular displays of a men-beast clash that can be seen. The modern Rapa das Bestas takes place during three days, on the first weekend of July. The first morning, at half-past six in the morning, the church bells start ringing, and firecrackers are released, in order to call all the villagers to a mass that is celebrated to ask for the Saint Lawrence’s protection and guidance in the Rapa. –after the mass, the participants and the visitors gather together at the Celeiro, the central spot of the village, to get ready for the Baixa, which is the name given to the act of bringing the horses down from the mountains. There are usually around 14 herds which are brought to the town’s outskirts, what makes a total of 600 horses. During the Baixa, it is very normal to make a pause to eat some appetizers accompanied by a local wine, a beverage that is strongly connected to many aspects of the celebration. After many hours, the horses start arriving at around three or four in the afternoon. The horses are then kept in a compound outside the village until the Curro takes place, at seven or eight that evening. A curro takes place every day during the three days this event lasts. 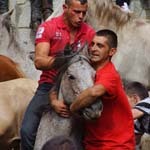 The Curro is the central part of the celebration; that is, when the male (garañones) and female (bestas) horses are brought into another compound (also called Curro) to have their manes chopped and to get an identification seal on them (nowadays, a microchip under their skin). One of the special features that the Rapa of Sabucedo has, compared with those taking place in other villages, is that in Sabucedo the Curro is a stone wall, whereas other villages feature a less eye-catching wooden fence. When the horses are brought into the Curro, it’s the time for the aloitadores to act. These men are in charge of holding the horses still while they’re being shaven and marked. They only use their bodies and arms to do this, whereas in other villages you may see ropes or sticks being employed for this matter. Three men are needed to reduce the horse and proceed with the rapa. Once the horses are shaven and marked, they are sent back to the first compound, and the children keep the chopped manes inside a basket. This is an important detail of the celebration, since the whole rapa ritual is considered to be a very important tradition that is communicated from the old to the young, also serving as a rite of passage from childhood to manhood. Around the Rapa das Bestas there are also many side activities: a fairground is installed with barracks where one can eat, drink, or relax from the strong emotions involved in the rapa, along with local music acts or bands of bagpipers. Summing up, this is a very impressive celebration that dates back to prehistoric times, a real tour de force between man and beast, between humans and nature, between tradition and modernity: a true reminiscence of a very ancient relationship between men and nature.